Southampton, NY, April 03, 2019 --(PR.com)-- Dan’s Papers Celebrates Its 60th Summer All Year Long. Dan’s Taste of Summer presented by Out East, the Hamptons real estate marketplace, is back for the season, offering incredible culinary events highlighting the best of the Hamptons, the North Fork and New York. Chefs from the North Fork and South Fork as well as Manhattan and across Long Island are gearing up to bring Hamptonites their best dishes while they listen to music, drink local wines, beers and signature cocktails and mingle the night away at some of the most picturesque venues on the East Coast. In its 60th summer, Dan’s Hamptons Media is proud to bring back Dan’s Rosé Soirée, Dan’s Chefs of the North Fork, Dan’s GrillHampton presented by New York Prime Beef, Dan’s Taste of Two Forks, and Dan’s Corona MonTaco. New to the summer event lineup is Dan’s Chefs of the Hamptons, bringing together the premier chefs from the South Fork for a dinner supporting Guild Hall of East Hampton, and Dan’s 60 Summers Gala, celebrating the 60th summer of Dan’s Papers and the release of the book 60 Summers: Celebrating Six Iconic Decades on the East End. Let’s raise many a glass to 60 more summers to come. Tickets for all events are on sale now at DansTasteOfSummer.com. Dan’s Taste of Summer presented by Out East presents this annual kickoff to summer in the Hamptons. As the unofficial libation of the season, there will be over 30 different rosé wines from local Hamptons and North Fork wineries, France, Italy, Spain and beyond, including Wölffer Estate Vineyard, Provence Rosé, Whispering Angel, Mirabeau, Montauk Wine Co., Jamesport Vineyards, Clovis Point and more. The event will also feature tastings from top restaurants in the Hamptons and New York City such as Rahi, Kingfish Oyster Bar, Jing Fong, Calissa and Union Cantina. Dance the night away to tunes provided by DJ Ria, and keep the celebration rolling at the official Rosé After Dark VIP After Party, presented by Whispering Angel, featuring live 80s and 90s music provided by The Ronald Reagans, plus exclusive wine pours and food provided by North Fork Chocolate Company and Shock Ice Cream. You won’t want to start your summer anywhere but here. Taking place at the historic Topping Rose House in Bridgehampton, there is no better setting for Dan’s Hamptons Media’s first ever Chefs of the Hamptons event. This exclusive event is the first time such a lineup of the Hamptons’ most-beloved chefs, including Drew Hiatt & Jean-Georges Vongerichten of Topping Rose House, Joe Realmuto of Nick & Toni’s, Eric Miller of Bay Kitchen Bar, Sam McCleland of Beacon, Jeremy Blutstein of Gurney’s Star Island Resort & Marina, Courtney Sypher of Sen, Jason Weiner of L&W Market, and Carissa Waechter of Carissa’s Bakery will come together for a one-night-only intimate dining experience. Chefs of the Hamptons will dazzle guests from its cocktail hour through its multi-course pairing dinner. All dishes will use locally sourced ingredients matched with exceptional wines and cocktails. A portion of ticket sales will help support Guild Hall and its vital role in the Hamptons community each year. Honoring the culinary and wine creators of the North Fork, Dan’s Chefs of the North Fork is taking place at the beautiful Halyard, with its exquisite views of the Long Island Sound. Back for its second year, this premier North Fork culinary event unites these talented chefs for one night only. Participants include Stephan Bogardus of The Halyard, Matty Boudreau of Preston House & Hotel, Brian Wilson of North Fork Table & Inn, Noah Schwartz of Noah’s, Jennilee Morris and Adam Kaufer of Grace & Grit and more. The night starts with a cocktail hour followed by a carefully crafted 5-course pairing dinner and desserts. All dishes will feature locally sourced ingredients paired with wines from the wineries of the North Fork. Dan’s Chefs of the North Fork redefines the farm-to-table and grape-to-glass experience. The Hamptons vs. New York City. At the 7th annual Dan’s GrillHampton presented by New York Prime Beef event, eight East End chefs including defending champion Matty Boudreau of Preston House & Hotel, Scott Kampf of Union Burger Bar, Peter Ambrose of Events by Peter Ambrose and Arthur Wolf of Smokin’ Wolf BBQ and eight New York City chefs such as Justin Bazdarich of Speedy Romeo, Mark Rosati of Shake Shack and Matt Abdoo of Pig Beach will go head-to-head in the showdown of the summer. Guests will sample each chef’s dish while enjoying the live music of the Back to the Eighties Show with Jessie’s Girl and sipping on cocktails, wine and beer, then vote on their favorite dish of the night while mingling with celebrity judges such as Adam Richman and Scott Feldman and ultimately choose which team, Hamptons or New York City, will win the overall competition. Dan’s Hampton Media is excited to bring back for its ninth year—Dan’s Taste of Two Forks. Bringing together the best restaurants and wineries from the North Fork and South Fork, Dan’s Taste of Two Forks is the premier food-and-wine celebration of the season. Top chefs from more than 40 restaurants and winemakers from over 15 vineyards will be serving up the best bites and drinks on the East End. Confirmed restaurants include The Frisky Oyster, Mirabelle, North Fork Chocolate Company, Spiro’s, Southampton Social Club and Saaz Indian. DJ Phresh will keep the tunes coming all night long while guests fill themselves to the brim with the best of the best. Dan’s Taste of Two Forks is the most sought-after ticket. In 1960, Dan Rattiner published his first paper in Montauk, and every year since, Dan’s Papers has been capturing the spirit of the Hamptons. Celebrating its 60th summer—and Dan Rattiner’s 80th birthday—in 2019, Dan’s Papers invites everyone to go back to where it all started. Taking place at Gurney’s Star Island Resort & Marina, the 60 Summers Gala will showcase food and wine of the Hamptons from restaurants such as Scarpetta, Showfish, Gosman’s and Duryea’s, while toasting to an incredible history and 60 more years to come. It’s an East End fiesta as some of the most celebrated chefs from the Hamptons and New York City spice up the night with their take on Mexican, Spanish and South American cuisine. Now in its third year, this tasting event features fresh culinary takes on such classics as enchiladas, mollete, burritos, tostadas, ceviche and, of course, tacos, plus endless margaritas, cerveza, top-shelf spirits and more, while guests eat, drink and dance the night away on the waterfront in Montauk. 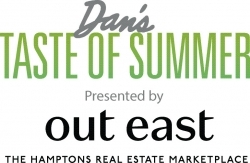 Dan’s Taste of Summer presented by Out East, produced by Manhattan Media’s Dan’s Hamptons Media, has quickly become the largest epicurean events series on Long Island, hosting upwards of 5,000 food-and-wine lovers annually. Since the first Dan's Taste of Two Forks in 2011, Dan’s Taste of Summer presented by Out East’s signature events—Rosé Soiree, Taste of Two Forks, GrillHampton and MonTaco—have become can't-miss nights on the jam-packed Hamptons summer social calendar. Follow @DansTasteOfSummer on Instagram for the latest scoop on Taste of Summer 2019 and use tag #DansTOS when sharing about the events. For more information and to purchase tickets, please visit DansTasteOfSummer.com. About Out East: Out East is the ultimate online destination for Hamptons real estate. Insider tips and locally penned guides on Out East’s content hub, Heading Out, complement a hyper customized shopping experience that lets buyers and renters search by town or view and see a home's proximity to beaches, farmers markets, transportation options, and other local points of interest. With the most comprehensive and up-to-date listings covering for-sale homes, short- and long-term rentals, and land for sale across the Hamptons, the North Fork and Shelter Island, Out East is the perfect way to discover your dream home in the Hamptons. Launched in 2018, Out East is owned and operated by Zillow Group. Follow Out East on Instagram @headouteast for the latest Hamptons real estate news and design inspiration. Dan’s Hamptons Media, LLC, is a Hamptons’ leader in media, offering a combination of print, websites, live events and a suite of innovative digital, mobile and social marketing solutions. In addition to its iconic print product, Dan’s Papers—which, as it celebrates its 60th summer, continues to be a well read publication with circulation on the East End—Dan’s Hamptons Media’s portfolio includes: DansPapers.com, a go-to website in the Hamptons and on the North Fork for What to Do, Where to Go, Where to Stay and Where to Play; Behind the Hedges magazine and BehindtheHedges.com, a real estate source in the Hamptons; Dan’s List, a users guide to the best of the best businesses East End; the Dan’s App, a dynamic app updated daily with original content on the East End; and a large Social Media footprint in the Hamptons, with nearly 50,000 followers on Facebook, Twitter and Instagram.